Growing up, each of us have that one dish that mom always made for us by default. She knew with her mothers’ intuition that even if you rejected her fancy fairy shaped sandwiches that she had just spent an hour cutting up, you wouldn’t reject this. For me, “this” was two things – glutton that I am – Bhurji and Dhandar. As shameful as it is to admit it as a Parsi, I grew up with a sort of mental allergy to eggs and detested having them in their natural form. So while a boiled or fried egg was a complete no-no, mom had discovered early that she could disguise them in a Bhurji – or Akoori as we Parsis call it – and then I’d happily eat it. Ofcourse, as I grew up fancy multigrain bread, avocado and oats replaced Bhurji as my breakfast of choice and mummy’s beloved breakfast dish was relegated to the background. But, there is only so much milk and oats or oats and fruit or oats and toast you can have before oats gets mighty damn boring. So, it seemed like serendipity when I was researching something new I could do with oats and I came across Quakers’s Tastiest Bowl of Oats Challenge. The challenge called for the cook to come up with a new way of eating oats that was still nutritious (there’s goes my dreams of Oats Ice-cream). After much brain wracking, I thought why not return to my roots and make something that always reminds me of mum and so was born, Oats Bhurji! 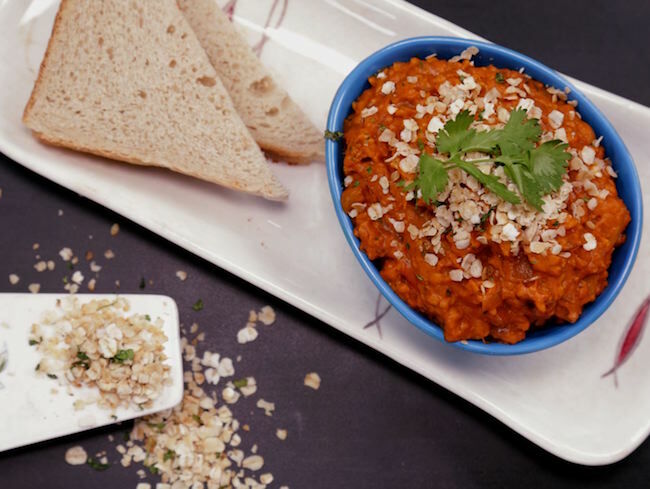 The best part is that this Bhurji is made minus the egg and is therefore completely vegetarian too – I hope you enjoy it. I’ve been contemplating doing video’s for a while so do share what you think about the video. If you detest videos, then I’ve got the usual recipe below for you as well. 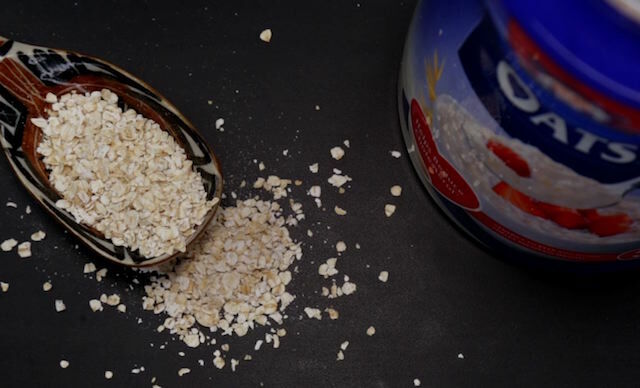 Finally, if you love experimenting in the kitchen too and have thought up a funky idea for making oats yummy again, then do check out Quakers’ Tastiest Bowl of Oats Challenge. There’s a grand prize of 50 Lakhs to be won – imagine how much Quakers’ you could eat with that much money! 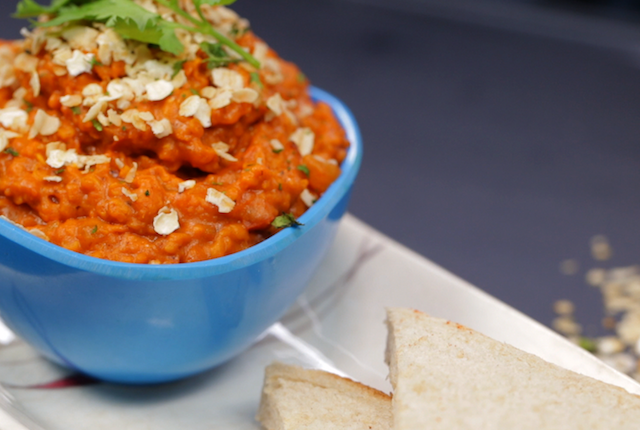 When the tomatoes begin to get soft, add in all the spices, salt and the tomato puree. Cook the tomato mixture until the spices are almost cooked. Add in the 35 gm of Quaker Oats and the 150ml of water and stir. Allow the mixture to simmer and for the oats to cook for about 3 minutes. If the mixture becomes too thick, you can add a little more water to cook the oats. Once its cooked, set aside. In a flat pan heat ½ tsp of butter. Add 5gm (about 1 tbsp) oats with the butter and toast until golden brown and crunchy. Mix in 1 tsp of the chopped coriander and set aside for the garnish.